modules (MUNLV 2003; VDMA 2005). Fig. 12.6 Membrane modules in submerged mode. (a) Kubota flat panel, submerged in an unit with bubble dififusor. (b) Zenon hollow fiber module, with air bubbling and a hollow fiber in detail. material with connections to one inlet (feed) and two outlet streams (permeate and concentrate) and a pump providing the driving pressure. Modules with tubular or plate membranes are described in Table 12.4. • Plate-and-frame modules, commonly known from electrolysis stacks, are often used for micro- and ultrafiltration and less often for reverse osmosis (e.g. Kubota flat panel; Fig. 12.6a). Similarly, there are membrane cushions with permeate spacers and support plates welded together with the plate membranes. • Spiral-wound modules are the standard configuration for reverse osmosis and nanofiltration modules. • Membrane cushions are although used in ultra- and nanofiltration modules. • Hollow fine fiber (Zenon; Fig. 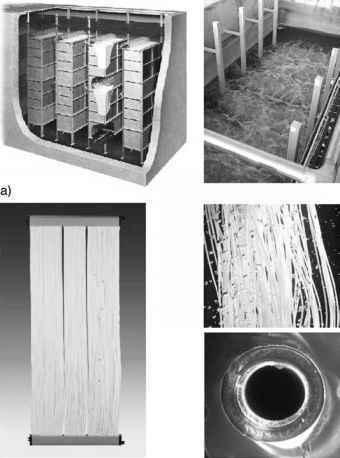 12.6b) and capillary membranes are self-supporting membranes with out-to-in flow direction for hollow fibers and in-to-out flow direction for capillary ones. 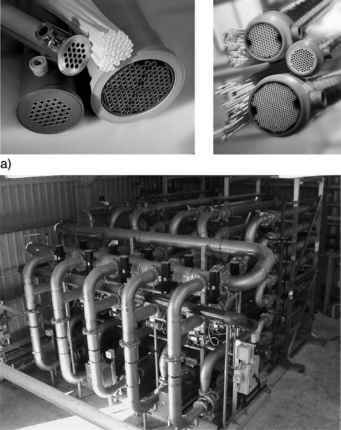 • Tubular membranes are used for high turbulence and good cleaning characteristics (Berghof 2005; Fig. 12.7a). An example for a complete process is the Wehr-le ultrafiltration plant in Fig. 12.7b. • High ratio of membrane area to module bulk volume. • Low pressure drop, low energy demand. • High degree of turbulence on the feed side to promote mass transfer. • Low costs per unit membrane area. Fig. 12.7 Membrane modules in cross-flow mode. (a) Berghof tubular module and membranes. (b) Wehrle, MBR, ultrafiltration plant for the food industry. For the treatment of a feed with a high suspended solids concentration, the demands for a high membrane area: volume ratio together with a design that facilitates cleaning is inconsistent and a compromise is necessary. 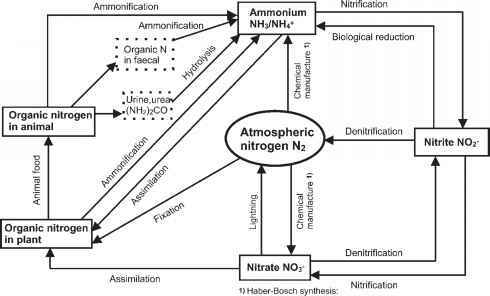 Furthermore, hydro-philic behavior, attainable permeate volume flux, cut-off and operational life of the membrane have to be taken into account. Configurations such as dead-end, submerged and cross-flow mode are used for ultra- and microfiltration.